Thoroughly mix the beef, 1/2 cup sauce, stuffing, onion and eggs in a medium bowl. Place half the beef mixture into a 13x9x2-inch baking pan and shape firmly into an 8x4-inch rectangle. Spoon 1/2 cup cheese on top to within 1/2 inch of the edge. Top with the remaining beef mixture to cover and press the edges to seal. Bake at 350°F. for 1 hour 10 minutes or until the meatloaf is cooked through. 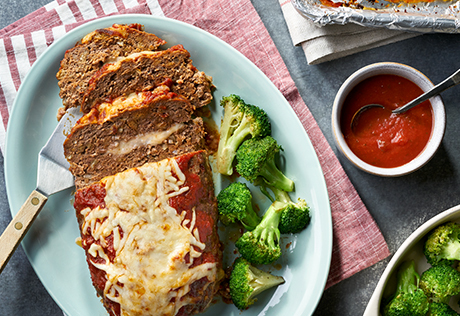 Spoon the remaining sauce over the meatloaf and sprinkle with the remaining cheese. Bake for 5 minutes or until the cheese is melted. Let the meatloaf stand for 10 minutes before slicing. For Mini Meatloaves: Divide the beef mixture into 8 portions. Place half of one portion in a 13x9x2-inch baking pan. Shape firmly into a 4x2-inch rectangle. Make a slight indentation in the center of the beef mixture and add 1 tablespoon cheese. Top with the remaining portion of the beef mixture to cover and press the edges to seal. Repeat with the remaining beef mixture and cheese. Bake for 30 minutes or until the meatloaves are cooked through. Top with the remaining sauce and cheese. Bake for 5 minutes or until the cheese is melted.